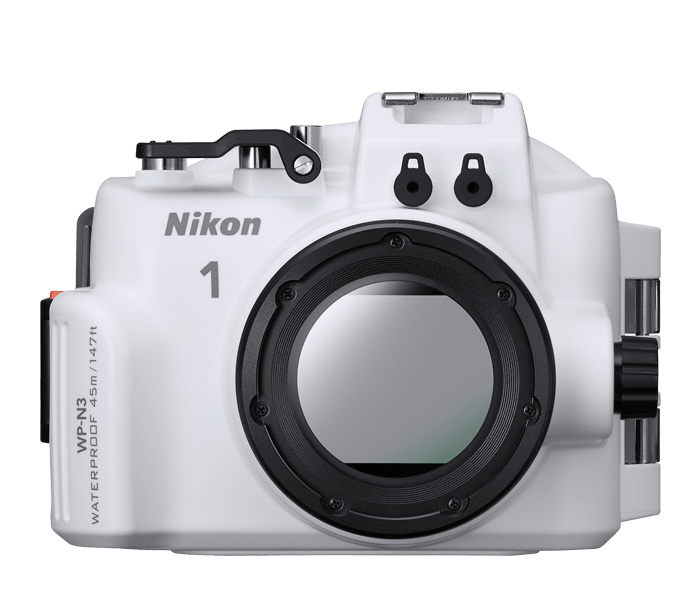 Your Nikon 1 can go everywhere you do—even underwater! Fully submersible to a depth of 147 feet deep (45 meters), the WP-N3 waterproof housing transforms your Nikon 1 J4 or Nikon 1 S2 into a waterproof, underwater camera that's perfect for SCUBA diving, snorkeling, boating, swimming, fishing, surfing or just having fun at the pool. Relive your nautical adventures with the stunning photos and HD videos only Nikon 1 can achieve. The compact and stylish Nikon 1 accompanies you wherever you go, now take it on the adventures that involve water! Compatible with the Nikon 1 J4 and Nikon 1 S2 and the 1 NIKKOR 11-27.5mm f/3.5-5.6 and 1 NIKKOR VR 10-30mm f/3.5-5.6 PD-ZOOM lenses, the WP-N3 waterproof housing lets you keep taking photos and videos whether you're above the sea or below. Add the optional SB-N10 underwater Speedlight and you can capture even more vibrant and colorful undersea adventures than a compact camera. If you've ever used a disposable waterproof camera, you know the photos just don't capture the magic of an underwater experience. But imagine having your Nikon 1 along with you while SCUBA diving or snorkeling, surfing or swimming—your photos and HD videos will be amazing! Nikon 1's ultra-fast autofocus will capture even the fastest action, and your Full HD videos will be stunning and life-like. The lightweight and sleek WP-N3 waterproof housing perfectly fits the Nikon 1 J4 and S2 and maintains your access to key camera controls and buttons. The zoom ring, Mode dial, Multi-selector, movie recording, playback, delete and menu buttons are all easily accessible from the housing's exterior, giving you the same creative control you enjoy—on land or underwater. The WP-N3 waterproof housing is fully submersible down to 147 feet (45 meters) so you can take it on serious SCUBA diving and snorkeling adventures. Capture spectacular still photographs taking advantage of the cameras' fast and accurate autofocus, high continuous shooting frame rates and creative effects—Full HD video with sound for life-like movies as well as special modes like Jump-Cut, Fast-Motion—make for uniquely crafted nautical adventures.